What can we say that isn’t better expressed by the photo? 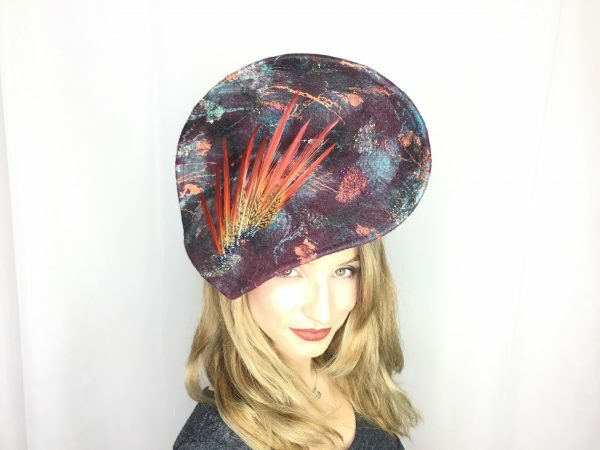 For this one-of-a-kind, jaw-dropping fascinator, we begin by creating the very fabric: an art felt made with merino wool, silks, metallics and other natural fibers. We then steam it and sculpt it into this flattering shape, and trim it with golden pheasant feathers and beading. This amazing art piece is held in place with a millinery elastic and one size fits all.